A weekly newspaper is claiming a hat-trick of successes after running three campaigns. The Rossendale Free Press has started the campaigns in recent months over council and health issues affecting people on the patch, all of which have now had victories. In its first success, the paper’s campaign forced Rossendale Borough Council to abandon plans to close three markets in the area. The authority also started procedures for a Compulsory Purchase Order at a derelict shopping centre in Rawtenstall after the title ran its ‘Time for Action’ campaign about the site. In the paper’s latest success, health bosses have agreed to review a decision to shelve plans for a health centre in the Rossendale Valley following pressure under its ‘We Need Urgent Care’ drive. 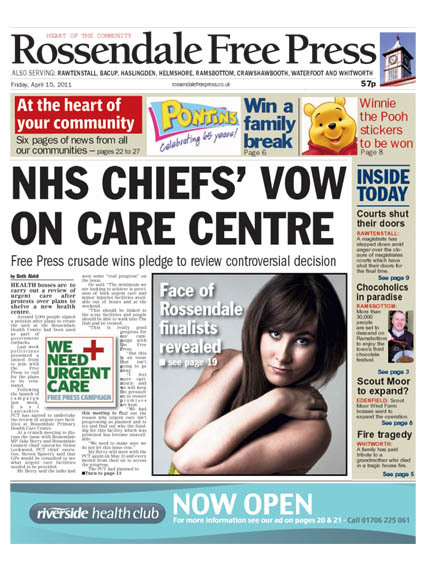 The success of the health centre campaign was highlighted on the paper's front page. The Free Press says its three campaigns garnered support from all sections of the community. Editor Gareth Tidman, who took charge of the paper last September, said: “These are issues that strike at the heart of life in the communities we serve and we were determined to stand up and be counted alongside our readers. “We have had some fantastic feedback from these campaigns and have shown to our readers that we are prepared to fight their corner. “The Free Press has long been a campaigning paper and it is a tradition that we are determined to preserve. It shows the power the press still has when working alongside readers. The paper is also backing a social enterprise which aims to take over a ski slope that closed as a result of council cuts earlier this year.